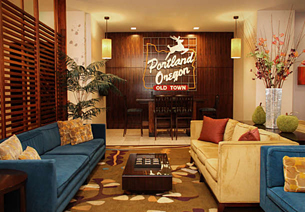 This downtown Portland, Oregon hotel reflects the distinct beauty of our urban home. Centrally located, we offer an ideal location for both business travelers and leisure guests. Near the Pearl District, Pioneer Square and the Willamette riverfront, we are in the perfect place to see the most popular attractions. Happy to be a pet friendly hotel, we are also close to parks and outdoor areas.